Danielle King, Au.D. 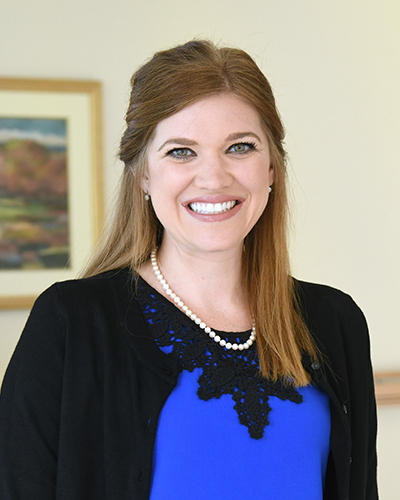 is originally from east Tennessee and graduated from the University of Tennessee, Knoxville with a Bachelor of Arts degree in Audiology in 2006, a Master of Arts degree in Audiology in 2008, and a Doctorate of Audiology (Au.D.) in 2010. Danielle completed a one-year externship at an audiology practice in Clyde, North Carolina, and then worked as an audiologist at that office from 2010 to 2012. She joined our staff at Greater Knoxville Ear Nose & Throat in 2012. She is a member of the American Speech Language and Hearing Association and a fellow of the American Academy of Audiology. Danielle especially enjoys treating hearing loss through hearing aids and assisted listening devices. Along with hearing aid evaluations and orientations, she currently performs diagnostic hearing evaluations at our office, as well as electrophysiological testing and vestibular evaluations. She and her husband currently reside in Sevierville and have two sons.